I say, eating is best done while in the napping position. But back to the point of this post: I thought some of you might like to watch some of the classic Purina* (brand) pet food commercials, too, so I compiled several of my favorites in a playlist (on the blog's YouTube channel)! And finally, who could forget the (miniature) Chuck Wagon? So, did you see any of your favorites? Hint: If not (ahem, Morris the cat, anyone? ), jump over to the playlist; it/they might be there! And a final thought: Is it me or are these pet food commercials a lot like sugary cereal commercials? I can still remember all of those, too. Those crafty marketers. Love these blasts from the past! Those were great! Glad you mentioned Morris, he was our favorite. 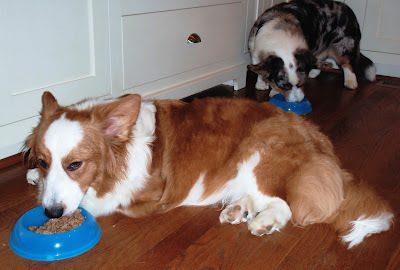 :) Love the pic of Jon Farleigh eating, our Dude cat used to do that too. True blasts from the past. LOL funny eating lying down. Never heard of that. Have a terrific Thursday. Good nostalgia...that chuck wagon would be fun to chase! BOL!!! My Human loves Morris...and, yes, she remembers the chow chow chow. Her Flat Coat Retriever liked to lay down to eat...always...guess he never grew up. Jimmy would be all over that chuckwagon is he saw that ad! Love these old commercials. Sure was easier to be a pup or kitty back then! Love the talking dogs one. I do remember most of those. And, yes, love the idea of a Twilight Zone episode with the chuck wagon. Hilarious.